Discussion in 'Disney Pin Discussion' started by Purplemandms, Dec 8, 2014. Okay. The title is kinda silly. Obviously we all have a bit of an art-nerd inside each of us, particularly because those on this website appreciate the artwork involved in these pins. But in this instance I'm talking about a very specific theme of pins: Pins which are based off of actual famous pieces of art. When I saw it my jaw literally dropped. For those of you who don't recognize it right away, it's a spin-off of Edgar Degas' sculpture "Little Dancer of Fourteen Years"
I know that there are other "masterpiece" pins out there, (like the Tinker Bell starry night one *swoon*) but this was the first one based off of a sculpture that I've seen. Let's get this exhibit up and running! Before I post some pins, I just have to say that I got to see the Dancer at MMoA last year when we went to NYC. I *loved* the MMoA SO much- I can't believe I had gone to New York twice before and never been (they were school trips, though, so not a lot of freedom of choice there). I cried multiple times while in the museum, and would go back to NY *just* to see it again. The three major series I can think of that follow this trend of the DA Masterpiece pins, the DS.com Fine Art series (the one your Dancer pin is from), and the pins from the Museum of Pin-tiquities. There's a few individual pins (like Jessica Warhol), and a few pins based on art as a hobby (like the ds.com Mystery set and Paint Swirl series). I'm rather fond of Jessica Lisa myself. I love Faberge looking things, and this fits the bill nicely. Ooooooh. Yes, I can agree with the Faberege. They are so incredibly detailed. And the Art Nouveau! Any of the pins classified as "Art Nouveau" are pretty gallery-worthy in my opinion. I've only been to NYC once, and sadly all we had time for was walking around the MoMA gift shop. :lol: I would love to go back though and actually see it in its full glory. Thanks for sharing! You have some great pins! Oh my. I'm shaking I am so excited. Where can I find these? A tribute to Henri Matisse's vivid 1910 oil painting "Dance"
Also a tribute to Edgar Degas' 1878 pastel "L'Etoile," also known as "La danseuse sur la scene." A tribute to M.C. Escher's mind-bending 1953 illustration "Relativity"
Ever since I first discovered the Masterpiece Series pins on Pinpics I have desperately wanted them! But they're LE 100, huge, and impossible to find for us mere mortals. I love Van Gogh so I've always wanted the Tinker Bell Starry Night even though I don't collect Tinker Bell. And since I do collect Alice and also adore Salvador Dali, I really want the White Rabbit Persistence of Memory pin. Yes low edition sizes from years ago mean high prices. Bahaha! I never noticed until now that where there's a man standing in the wings in the original, in the pin it's clearly meant to be the alligator, as there's a tail and a tooth! Also HEY YOU HI HI HI haven't seen you around in a while! HI! Okay so after falling off my chair for not thinking of two of most prized possessions, I took a picture of them together to share with you their beauty up close and personal <3 here they are! And the Little Mermaid pin is styled after the sober Midwestern farm couple of Grant Wood's celebrated 1930 oil painting "American Gothic" (Although I must say it was an inappropriate choice in my opinion to use Ariel and King Triton to portray a couple) UPDATE; I stand corrected! Thanks Unibear <3 "it is supposed to be a farmer and his spinster (old maid) daughter. She does look rather old (probably due to her dour expression), but that is supposed to be his daughter. So, Triton and Ariel make perfect sense as substitutes..."
Simply stunning pin in person, as are all the Masterpiece pins. The Masterpiece and Gomes pins are arguably the most beautiful pins ever made. One caveat for those looking to collect now - most authentic ones have been in collections for years and several Masterpiece pins have been faked and on ebay for the past few years. The actual house is in Iowa, not too far from where I used to live. Haha! Nice! That's good to know <3 I always thought it was a husband and wife painting. Now I like the pin even more Thanks Unibear! Are you aware that there is another pin based on the Degas sculpture? Many of the pins from the Museum of Pintiquities, which was the 2009 Epcot pin event would fit the description of this thread. And the interpretations of real art, is one of the reasons that event is my favorite. One of pieces from that event, was a Diorama that featured Minnie in the role of the dancer. Unfortunately, that pin has been counterfeited/scrapped. And I'm not sure how many of the full sets exist. None of the dioramas sold well at the event, and when they showed up at the last CM pin party ever held, one group of people cleaned off the entire table before most people could even get to it. I imagine they broke them all up to sell/trade. This is the concept art from the catalog. They tried to make them look more like sculptures with coloring, so I think the Tink is a more effective pin than Minnie. Now that I think about it, I have seen that Minnie! I guess I just never associated it with Degas. That Belle one is one of my favorites! (I have it in the siggy I've been trying to format, but I forgot to add it to my wants thread.) And Ah! That fantasia Degas! That's so cool. Boo low editions and high prices. But, at least they have something further in common with their originals. :lol: At least there's more than just one copy of them in the world! Thanks for sharing everyone! These pins are wonderful! Thank you for your great contributions to the thread! Have fun with your productivity! 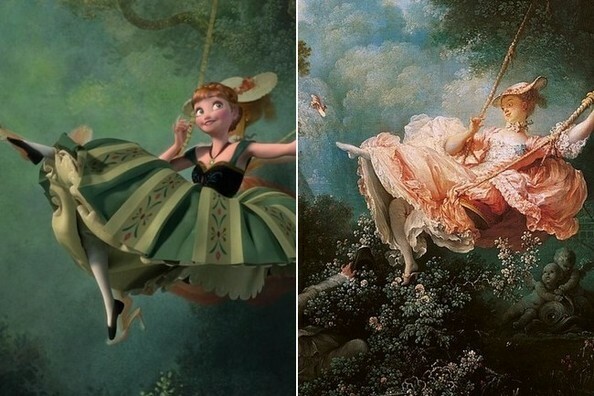 And here's a side-by side comparison of it with it's original work, Jean-HonorÃ© Fragonard's "The Swing"
Okay that's it back to writing this paper goodnight.